Record is in VG+ condition, light scuffs, plays quite nicely. Labels are good. Jill Allen with the Trumpet of Pee Wee Erwin performing My Melancholy Baby / Hold Me Closer. Sultry Vocals backed by a rhythm section and some lyrical trumpet work; imagine Lee Wiley with Bobby Hackett and you'll start to get the idea. 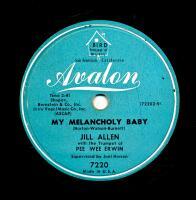 These sides were issued on Coral the following year after some success on the smaller Avalon label. Terrific and Scarce Female Vocal 78 in Nice Condition.